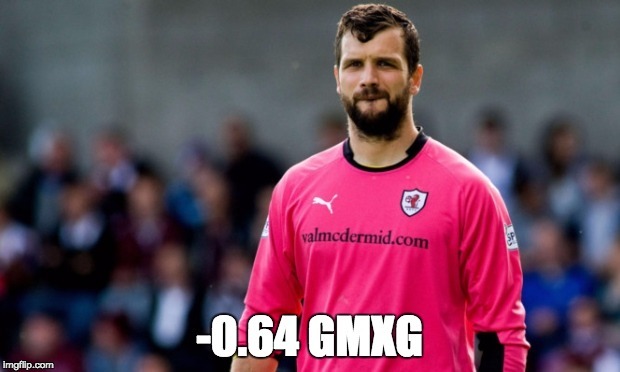 Throughout the 2015-16 season we hope to provide regular snapshots of which players are leading the way in the Scottish Championship in a variety of advanced statistics. Quarterly, more in-depth leaderboards will be provided, for both players & teams. Don’t forget to check out our Elo Ratings & Expected v. Actual Points leaderboard pages which will also be updated regularly & can be found at the top of the site. Note: normally we will provide a cap for how many minutes a player will have needed to play in order to be considered for any per 90 minutes statistics – but it’s only week one. Let’s be be a little reckless! Oh, this is a ridiculous stat to look at after only one week (but extremely enlightening as more of the season passes). 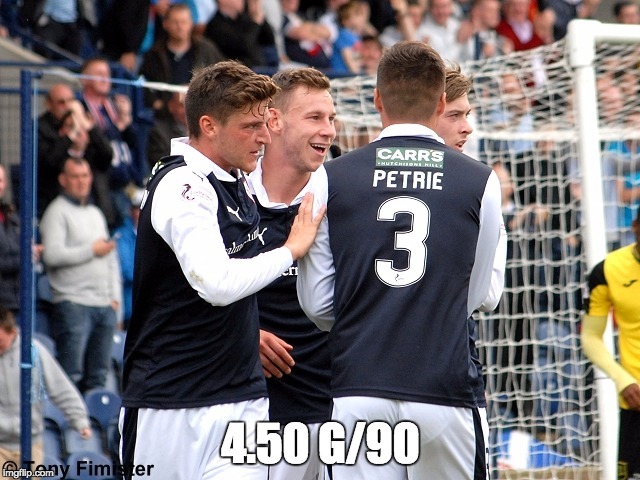 The 23-year old came on as a sub in the final 20 minutes & scored an extra-time goal in Raith’s 3-0 victory. The 18-year old assisted on two of Queen of the South’s three goals in week one. The Rangers forward continues to get his chances, five shots against St. Mirren – three coming from within the penalty box. It’s still early & his finishing needs refining, but if he keeps creating shots for himself – the goals should follow soon after. The veteran dominated the offensive output in the victory over Alloa Athletic. 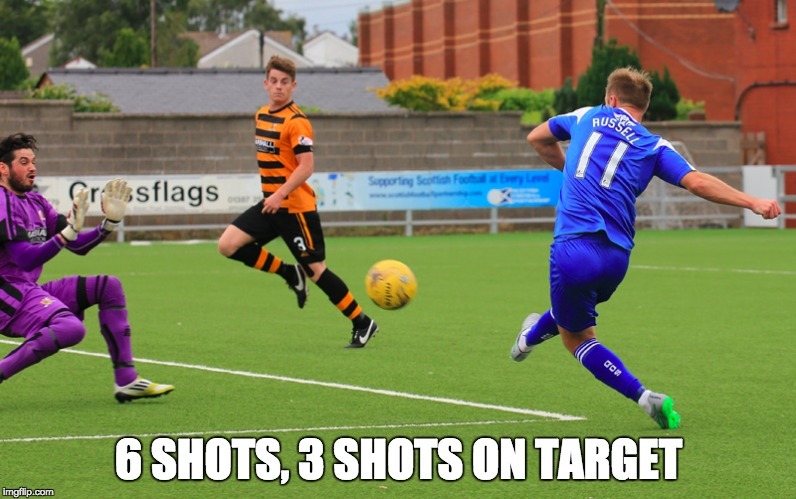 Russell had six of Queen of the South’s 13 shots & scored two of their goals. This advanced stat developed by Bill Reno & American Soccer Analysis is explained in this introductory post & really is not meant to be a short-term stat to look at, but our mantra after week one is to have a little fun with the analytics. Cuthbert was the only keeper to get a shutout this week, so he ascends to the top of the list. This stat will become much more relevant as the months go on to assess how well a goalkeeper is performing compared to his expected results. If there is an advanced stat to evaluate managerial performances (besides actually winning matches) it’s this one. How well did a team do compared to how they were supposed to do? 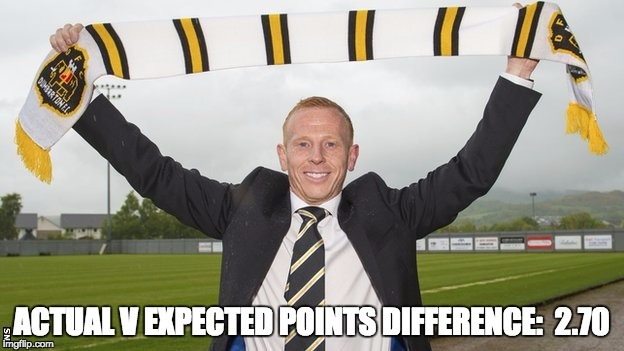 Dumbarton’s upset of Hibs sends new manager Stephen Aitken to the top of table.